I wish I had taken a before picture of this machine. This might be the lowest serial number I'll ever see. This Quiet de Luxe will be under someones tree. So will this Futura 800. 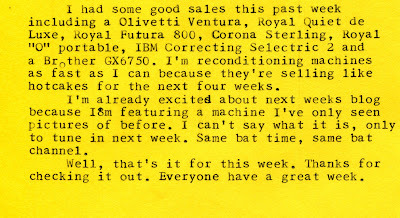 Same deal for this Olivetti Ventura. This was for sale until my daughter fell in love with it. 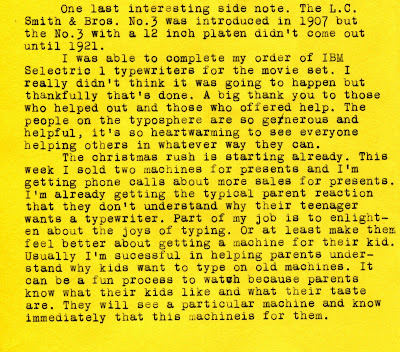 The L.C.Smith is a real nice machine. 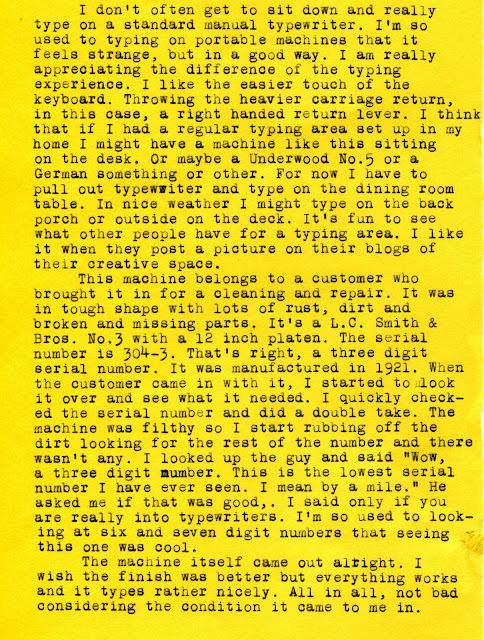 I never saw a machine with a right hand carriage return. I wish I had room for a desk machine also, a real old one. I barely have room for my portables. 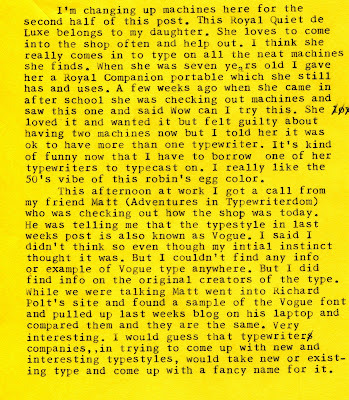 I like the Futura 800 I have one on my typewriters wanted list for 2012. Another very nice and interesting blog update. Can't wait to find out about the mystery machine next week! Some standard machines, like the Royal KMM, seem to have a typing feel and speed that can't be matched by any portable. The carriage is heavy, though! My Underwood 5 is a wonderfully solid typewriter, but the carriage return is extremely heavy and I get tired after only a few moments of typing on the flat, glass-topped keys. But I still love it! Ace post as usual. 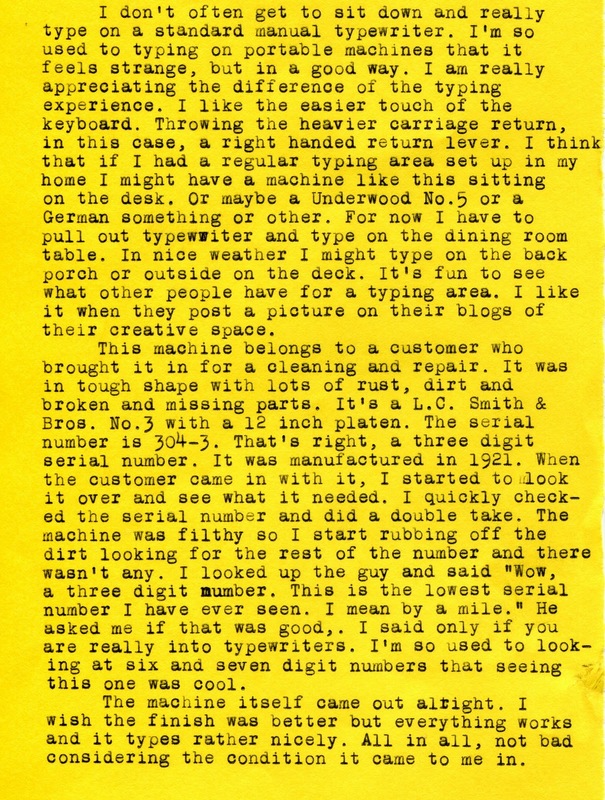 I was wondering if I could be an honorary typewriter professional, now I have a couple of machines in harness earning a few pounds from Type-O-Matic? I have no room for standard machines - yet I have two and I have been using them both quite a lot recently. Both were gifts. Both needed varying degrees of overhaul. They've absorbed some of my DNA now, so alas, I couldn't part with either. Looking forward to next week's update. Bill M.- I like the right handed return lever. It so different to pull the carriage back opposed to pushing it back. 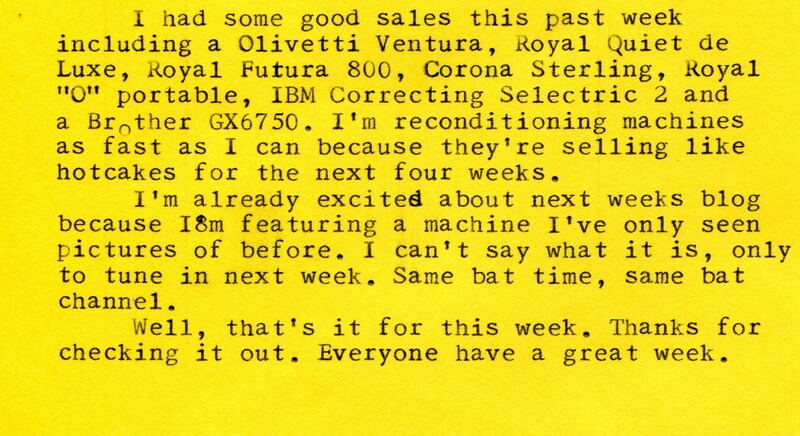 You should be able to get your Futura 800, there's a lot of them out there. Richard- I'm getting into standards lately. Just a lot of fun to type on. I kind of like the heavier return. The KMM is especially nice. Thanks. Cameron- A friend was showing me recently how to really type on a large machine and the trick is to put your whole body into it. Not just your fingers and forearms but upper arms, shoulders and back. He says you don't get tired fingers that way. 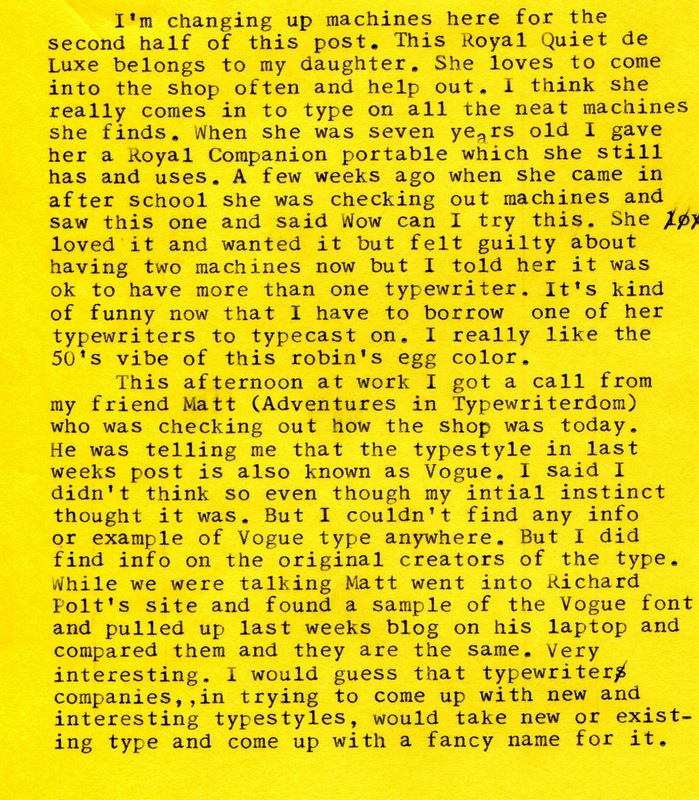 Rob- You are most definitely an honorary typewriter professional. 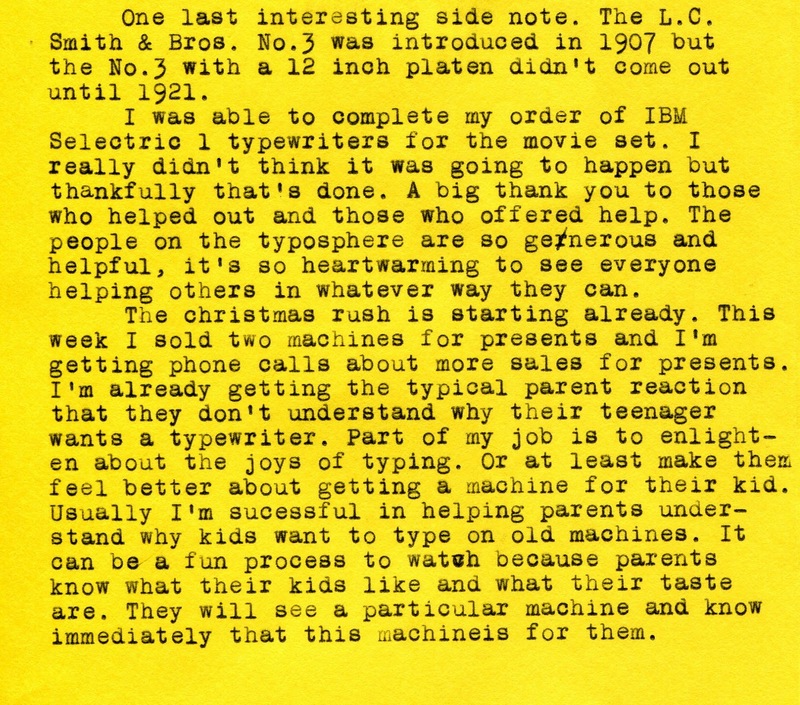 Anyone as passionate about machines and spreading typewriter joy the way you do is a member! Thanks! Lovely blog. I just picked up an Olivetti Ventura for my typewriter lover teenager but need a ribbon. Any ideas? Would love to get it cleaned up. Tacoma, WA area. Know anyone? Thanks very much.